It's about time I wrapped up our Disney trip posts. Just two more days to go. Day 8 was Friday and the day after we had been out late at the Halloween party. So we planned the morning to have chill out time at the resort. Loved waking up to this view each day. 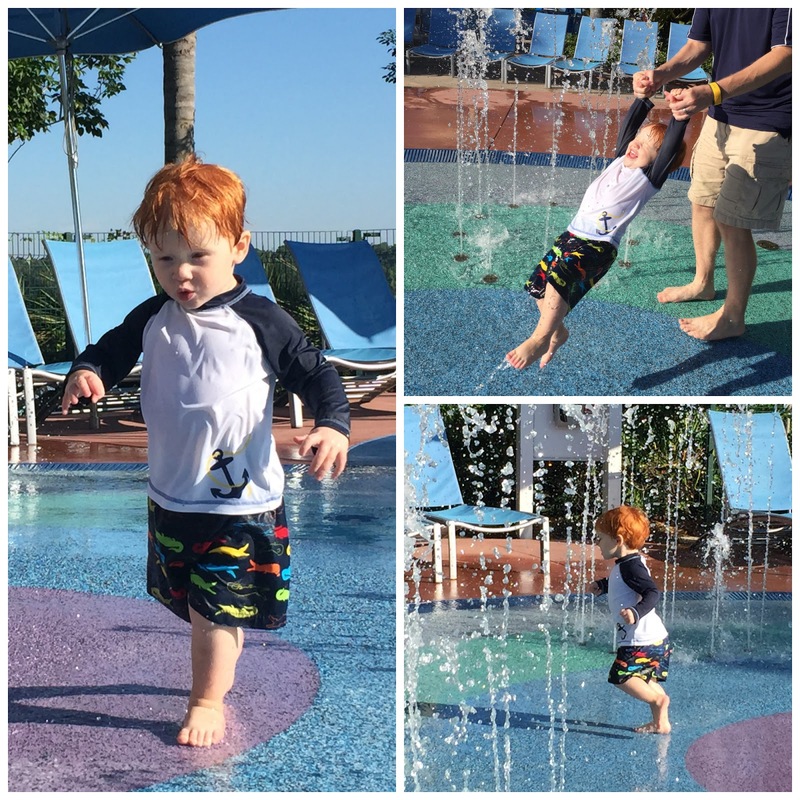 We played at the toddler splash pad at the resort for a little while that morning. P loved it and could have played there all day long. And first thing in the morning we had the place to ourselves. P was so sad to leave and go inside. 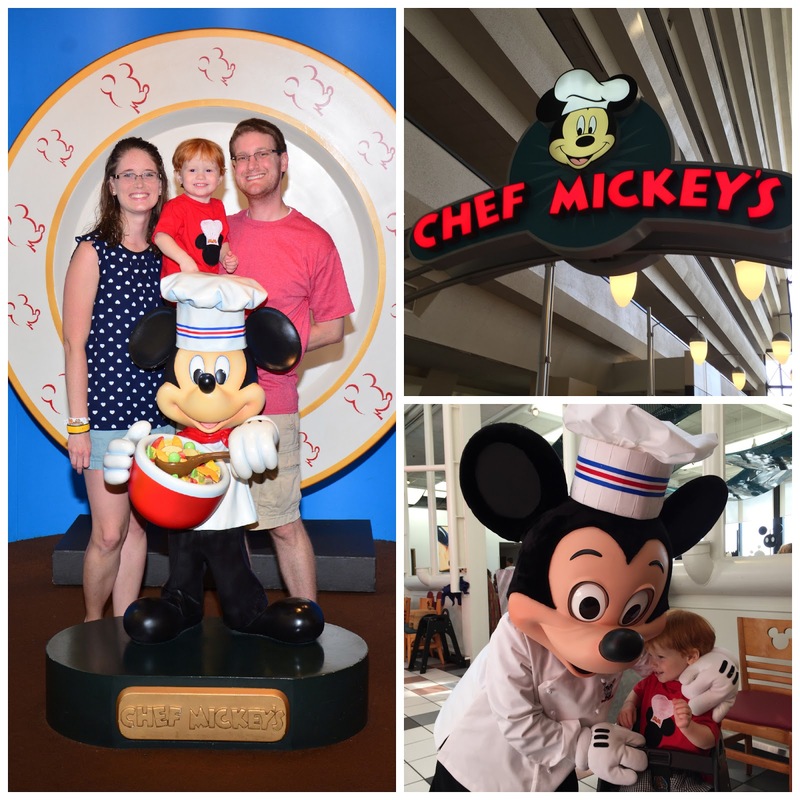 We did eventually have to leave the splash pad to go get cleaned up for brunch at Chef Mickey's, the character meal inside the Contemporary. 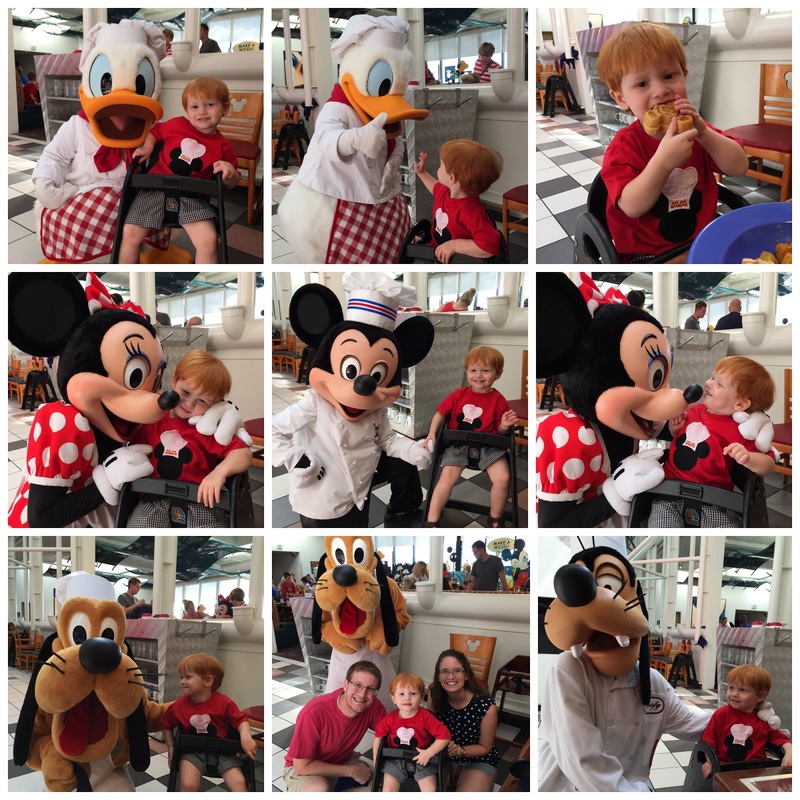 We had a great breakfast and interactions with the characters. It was the fab 5 - all of Perry's favorites. Like most buffets the food is was good but not anything too special to write home (ie blog) about. Mickey shaped waffles are always fun though. After lunch Andrew took Perry back to the room for a nap and I headed into the Magic Kingdom on my own to do a little shopping, meandering and picture taking. We all met up later that afternoon to use our most coveted fastpass. The Elsa and Anna meet and greet. Just for comparison sake, when we walked up to use our fastpass the current standby wait time to meet the Frozen queen and princess was 105 minutes. Fastpass to the rescue. 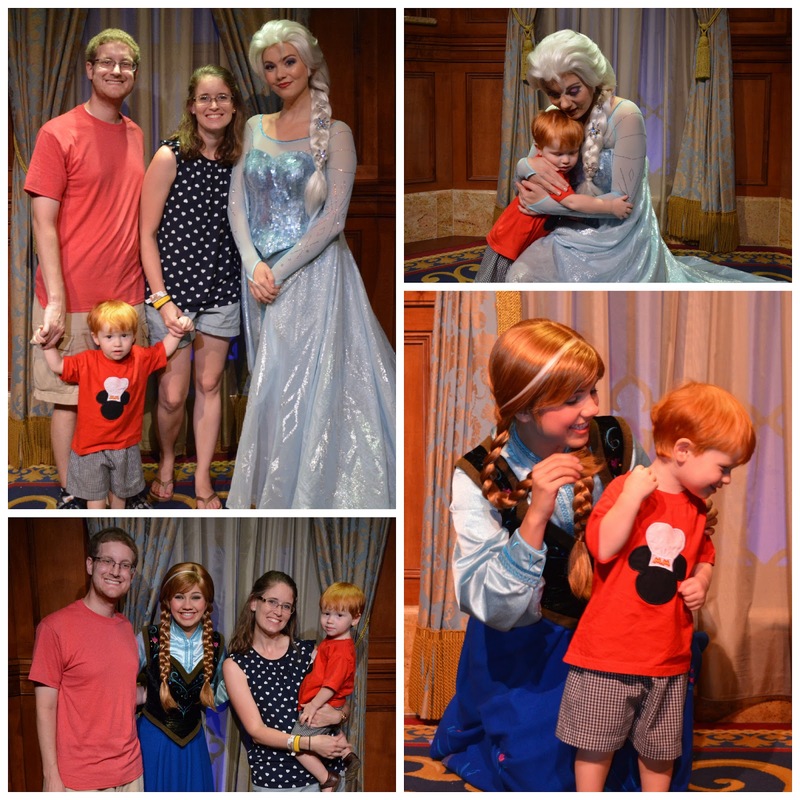 We had not been able to get Granna and Grandaddy a fastpass for it, but we were able to let them use two of our "free fastpasses" we were given for being family of the day a couple days earlier so they got to come with us and watch the kids meet Elsa and Anna. Perry didn't love most of the disney princesses and was a little stand off-ish. But he loved Elsa and Anna. Probably because he knew who they were. He especially loved Anna and that she played with him. She was so fun and tickled him with her braids. 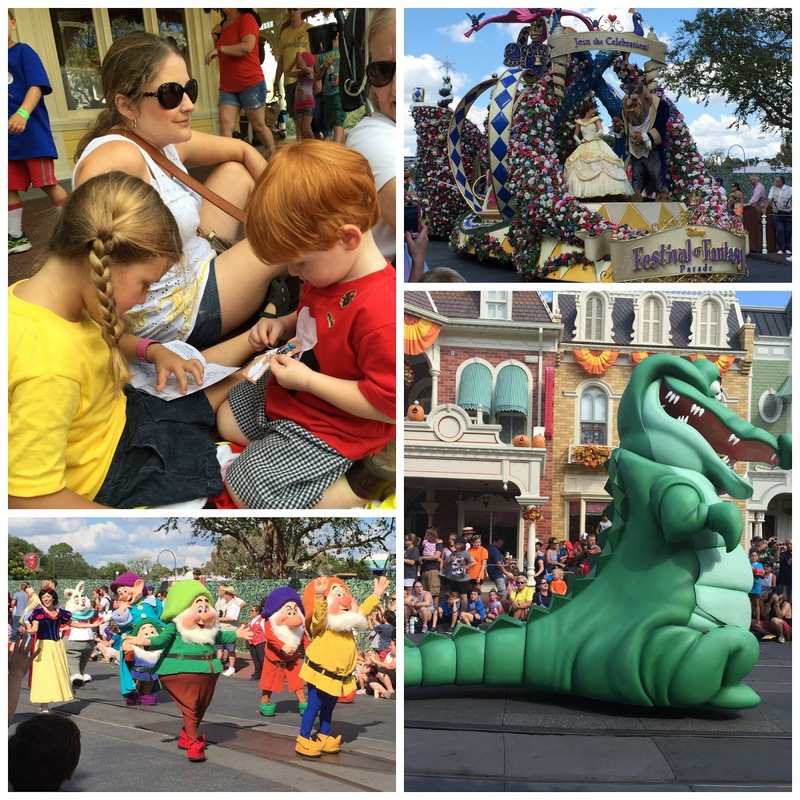 After that the girls and Perry went to watch the afternoon parade while the bigger boys played some Sorcerers of the Magic Kingdom. 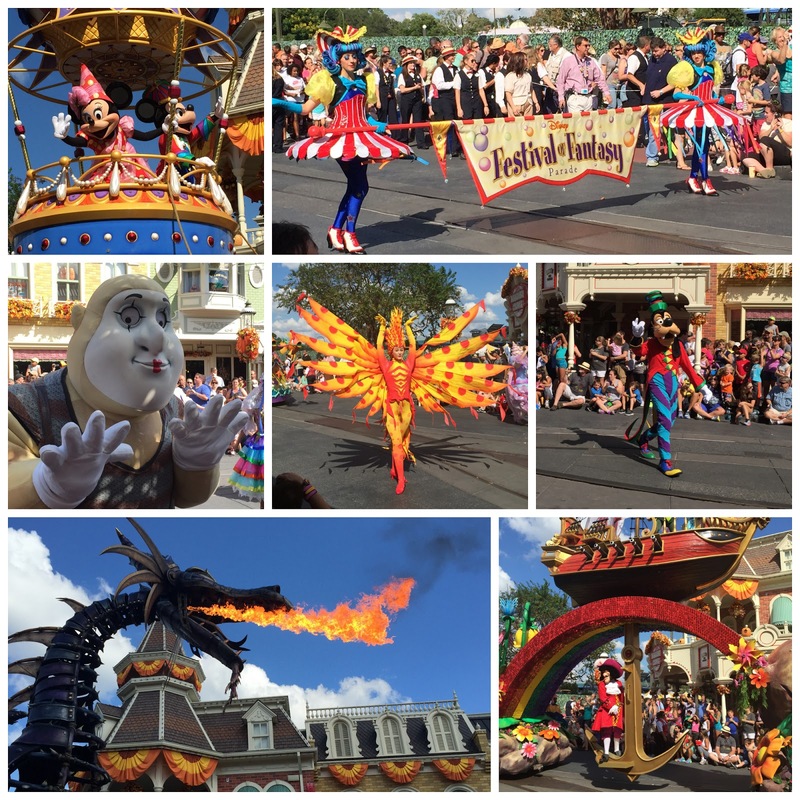 The Festival of Fantasy parade is just spectacular all the way around. We somehow managed to find a great (covered) place to sit and watch right on main street. Perry and Kate played so sweetly together while we sat and waited for the parade to start. Then they both waved to the characters on the floats as they went by. After the parade our family went and rode the Jungle Cruise and then we all met up for dinner in Beast's Castle at Be Our Guest. Dinner was early because you take what you can get when you are trying to get a party of 8 at the hardest restaurant to get into in all of Disney World. But we had only had brunch that day so we were ready to eat come 4:45. Dinner was really good as expected. We got to eat in the dark West Wing which is what we were hoping for. They don't often put little kids back there because of the darkness and simulated thunder and lightning. But Matt strategically told the host when asked if we had little kids in our party that we did but that they actually like thunder...and we got seated in the West Wing. Whether that made a difference, who knows. And Perry did just fine amidst the "storms." 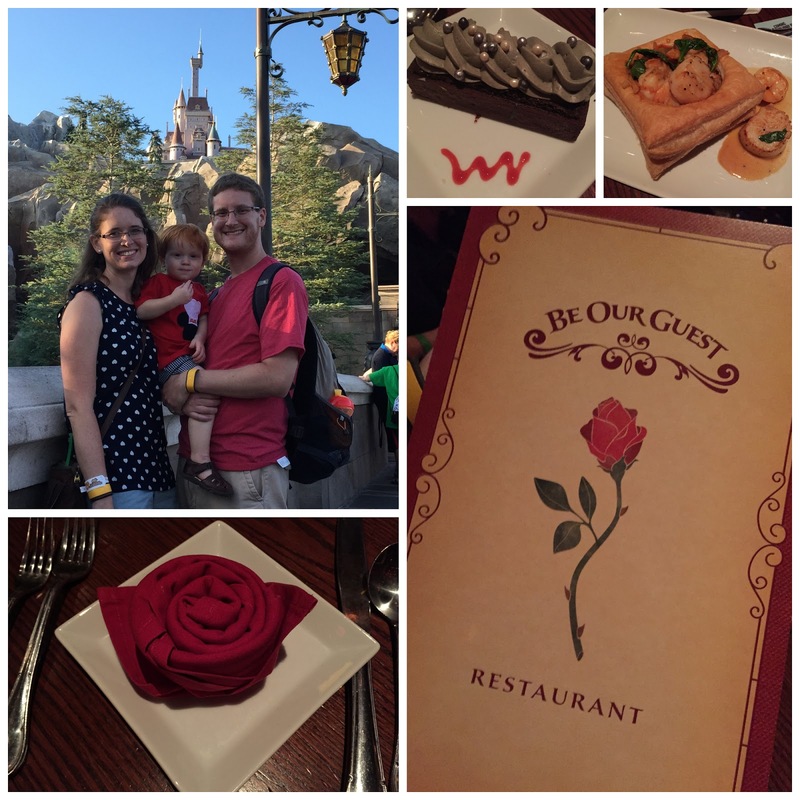 I think Perry's favorite thing he ate all day was the macaroni au gratin at Be Our Guest. 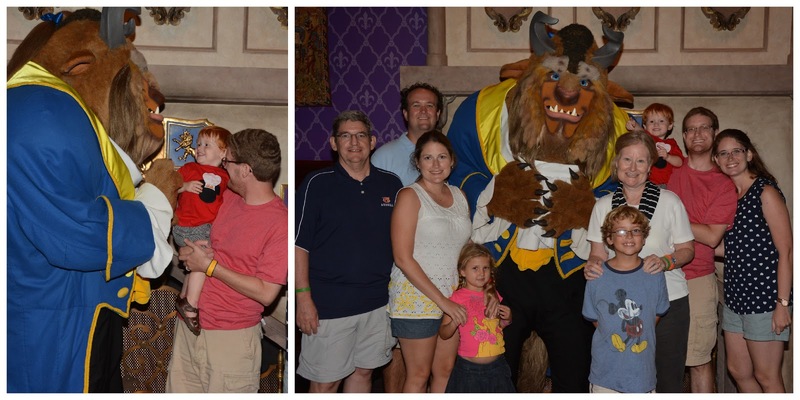 After dinner was over we got to meet the Beast on our way out. Perry did really well with the big furry beast until he accidentally hit P in the head with a horn and that kind of freaked him out (for good reason). After dinner we took one more ride on Pooh and headed out of the park. It was a Halloween Party night at the Magic Kingdom and so anyone without hard tickets had to get out by 7:00. It worked out ok because we all needed to get back to our rooms and pack up to head home the next day. We had to say goodbye to Granna and Grandaddy since they were headed home early the next morning and were not going to be in the parks the next day with us. After we got things pretty much packed up we decided to go walk outside to the sky bridge between the Contemporary Resort and Bay Lake Tower to watch the Hallowishes fireworks over the Magic Kingdom one last time. 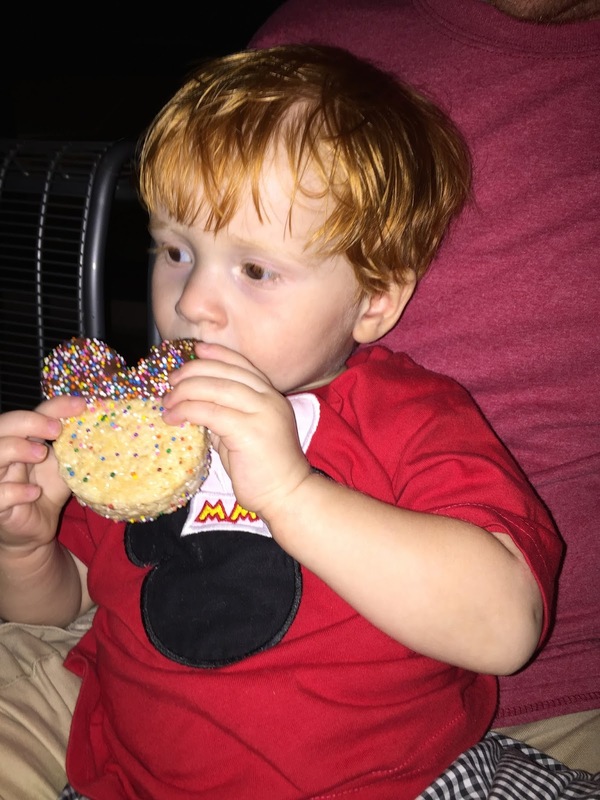 And we let this little guy snack on a chocolate covered mickey shaped rice krispie treat. Because when you are at disney world...why not. It was a great way to end our last night in Disney. 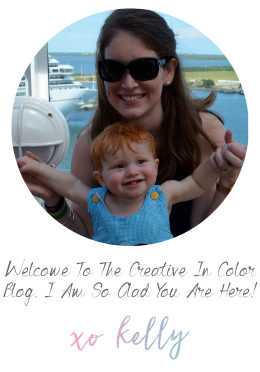 We loved staying at Bay Lake and being so close to the Magic Kingdom.